French twelve-arm chandelier from the 1960s in brass, black metal with opaque white shades. 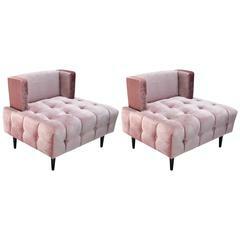 Pair of custom tufted lounge chairs upholstered in pink silk velvet with wood legs by Adesso Imports. Can be done in different colors and fabrics. Custom pedestal dining table with walnut veneer and brass leg. Measures: End depth: 34" Base: 27" x 45". Gorgeous Art Deco console table from the 1930s that can also function as desk. Beautiful metal legs and drawer pulls, covered in leather. Full length French Louis XVI mirror with carved giltwood frame featuring ribbons and roses with a beveled mirror. Tiered chandelier from the 1970s with clear and orange Murano glass pieces on a brass frame. Large drum shaped chandelier from the 1980s with Murano tulip glass on a chrome frame. Chain and canopy add 24" to the height. 102 bench by Jorge Zalszupin from the 1960s in parquet Brazilian jacaranda with two seats and metal base. 1960s Brazilian jacaranda sideboard by Scapinelli in a parquet checkerboard pattern with brass hardware. The two end cabinets have two shelves. The single middle cabinet has drawers.